Exploration is a bit awkward to write about – a large part of the fun is discovering stuff for yourself, and I don’t want to totally ruin it for you. On the other hand, I think it’s an interesting topic, so, a compromise: most of the blog post will be focused on the mechanics and systems in play, with less in the way of specific examples and screenshots. If you’ve read the previous blog post about planetary surveys, you know that procedural generation is already in the dev build. In a literal sense, flying around new star systems every game and checking them out is exploration, but clearly that by itself wouldn’t really merit being called that, not as an official feature. Even if (if I do say so myself!) the procedural generation produces some pretty nice starscapes. So, what makes exploration fun, and why do we want exploration in the first place? If we didn’t take this into account, we might end up with a bunch of very cool exploration-related features that wouldn’t form a cohesive whole. Then they’d need to be tied into existing mechanics, and it’d be a mess. Much better to start with a clear idea of why we’re doing this in the first place. The tricky part is when the mechanics you want to tie into are themselves not fully fleshed out. Then you have to make some assumptions that you think are relatively safe, go with them for the time being, and hope for the best while expecting some of them not to hold up in the long run. This question has several layers to it. On a basic level, exploration is about finding stuff and being rewarded for it in some way. Mechanically, this tells us two things: 1) we need lots of variety, so that the player isn’t finding exactly the same things over and over again, (i.e. a large part of this is content, even if it’s combined procedurally to get more mileage) and 2) there have to be rewards (that one’s a bit of a “duh”). 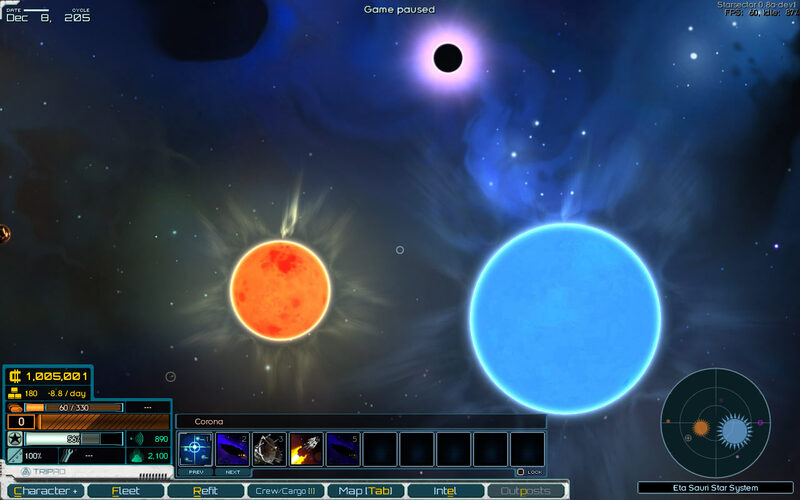 Then you’ve got the second-to-second gameplay of exploring new star systems. A lot of that is going to involve flying around; there’s no avoiding that – and some amount of travel time is desirable, just because it helps create a feeling of distance between places. Still, we want to cut down on “boring” travel and make travel more exciting – approaching the same problem from both ends. This is another case where not having a good answer to the “why” might lead us astray. What would make travel more interesting? Add a ton of terrain! Anomalies, coronal mass ejections, rifts in the space-time continuum, etc. Heck, with enough terrain, you could practically be playing a platformer with your fleet. (Note to self: coronal mass ejection events sound like fun.) The problem is that it wouldn’t be connected to the rest of the game in a meaningful way. The best way for a new game system to contribute is to tie into existing game systems. Simple systems and lots of interactions between them is what we want. Combat is a large part of the game, so anything that helps lead to it is good. 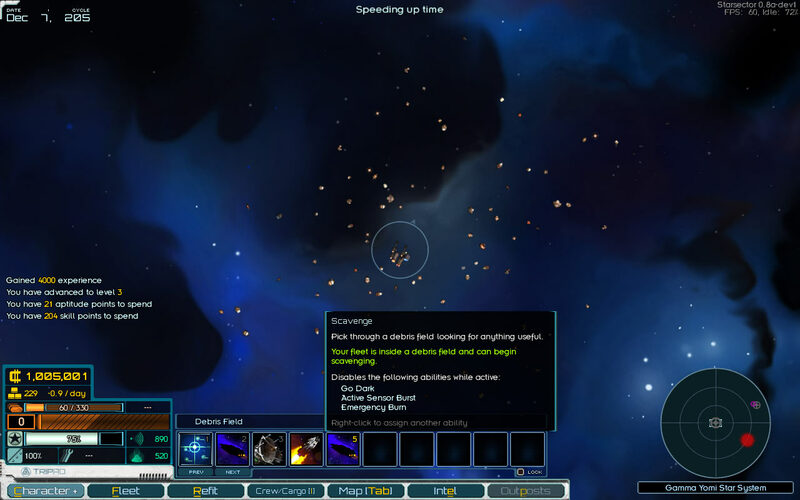 The long-term gameplay arc of surveying planets, establishing outposts, defending them (leading to combat) and eventually producing fleets (also leading to combat) is a good one to tie into as well. Combat then feeds back into these systems – you do well at combat, which either directly or indirectly improves the prospects of your outposts, which leads to more combat. That’s the ideal scenario, and the kind of high-level gameplay loop we’re aiming for. 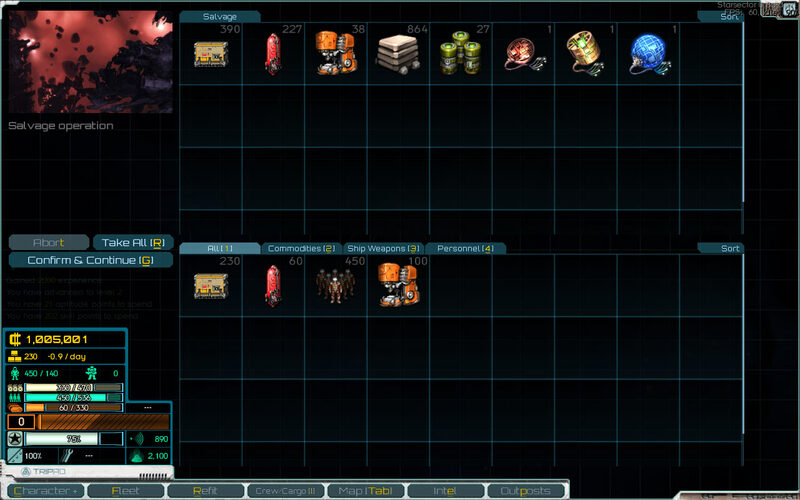 Finally, the early game is definitely on the tough side, so if exploration can help with that, that’s all to the good. The backstory is about a slow decline of civilization in the Sector, but that hasn’t been fleshed out very much in-game. So: you’re exploring star systems, sure. But you’re not boldly going where no-one has gone before; you’re going where many have gone before, didn’t do so well, and left stuff behind. Since we want to tie into combat, some of the stuff left behind is automated and shoots at you. 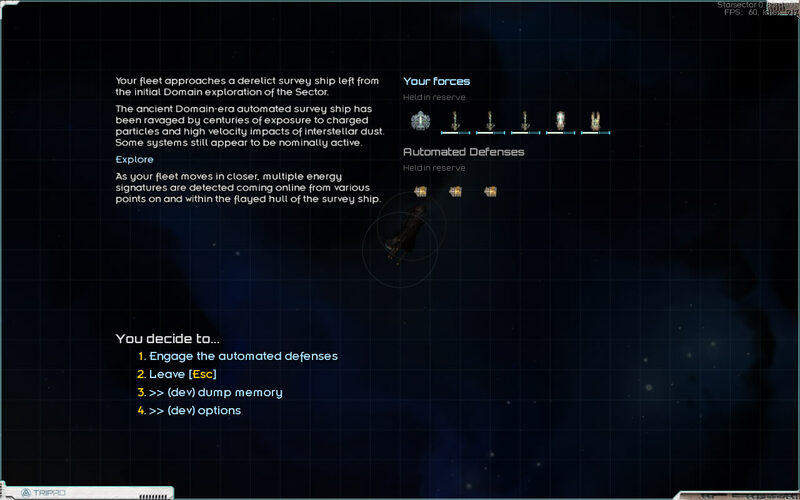 This is a good opportunity for some easier starting combat, as these automated opponents don’t have implied parity with the types of ships the player can pilot. They’re completely new hulls, so it’s ok for them to be weak – and they’re automated, so their governing AI is not going to make the same sorts of decisions a human captain would. It’s also a potential opportunity for some higher-tier opponents. There are already mechanics to liven up campaign gameplay – namely, sensors, and active abilities – and taking advantage of these makes more sense than adding in something entirely different. To that end, the derelicts and other such you find aren’t immediately visible on the system map, but have to be found. Once found (with an associated experience gain as a reward), they stay discovered – predictable orbits and all that. Salvage works similarly to planetary surveys, since the overall goals are similar – having it be governed by a skill that’s neither an absolute must nor useless. Each wreck, installation, etc has a “salvage rating”, and your skill needs to be up to par to be able to conduct proper salvage operations. You also need enough crew and machinery for the task at hand. Or, you can always blast it into bits and pick through the resulting debris field. Naturally, that’s not going to net you quite as much stuff, and is risky to boot – but still a good option if you’re not planning on investing in the skill that lets you do things properly. A bit of a side note: “Construction Rigs” are now “Salvage Rigs” and grant a bonus to the common salvage found. They don’t affect “special” salvage (such as in the unexplained screenshot) so that salvaging without rigs doesn’t feel like a waste of an opportunity. Finally, I’d like to try having battles generate debris fields. It’s just such a cool concept, and picking through post-battle debris left by other fleets could be a very nice way to get a leg up when starting out. This isn’t directly tied to exploration, but I think is a good sign that the mechanics interact nicely with what’s already in place – it just makes sense. That said, debris fields from battles aren’t implemented yet, and might not pan out, but I’m certainly going to give it a try. As I mentioned earlier, content plays an important role here. The work on salvage and exploration is in the “tying up loose ends” stage (which can still take quite a bit! ), loosely to be followed by adding a large chunk of related content – new kinds of things to discover, various possible “specials” when you do, different types of defenses to face, etc. A big part of this is adding procedural generation code that seeds generated star systems with things to discover; this could also take a little time to get right. In addition, some missions to act as hooks that guide a new player towards exploration seem very much in order; e.g. “there’s a survey probe here, bring me its data” – and then you run into other things along the way. So: not quite done with these, probably about midway through, but looking promising enough and in good enough shape to talk about! This entry was posted on Sunday, July 17th, 2016 at 9:09 pm	and is filed under Development. You can follow any responses to this entry through the RSS 2.0 feed. Both comments and pings are currently closed.